Wow, this week has just flown by…can you believe it’s Thursday already? 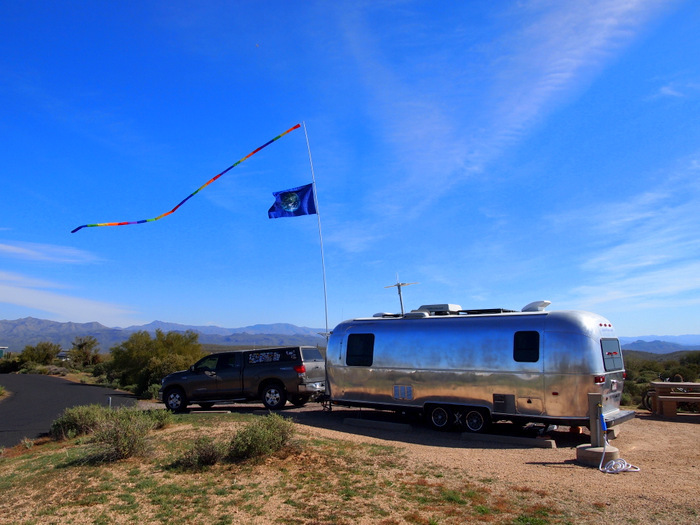 We’ve been here at McDowell Mountain Regional Park since Sunday, and have been happily toiling away the days soaking in the views, basking in the sun, and exploring the miles and miles of prime hiking & biking trails. Prior to our arrival we heard a lot of buzz about this park and how magnificent is was. Well I am happy to report that it’s all true. The sites are large, with the majority offering good separation, the facilities are immaculate, the hosts friendly and helpful, the views outstanding, and with over 40 miles of trails the recreation is endless. All this excellence means that McDowell is very popular and even more difficult to secure a reservation than at Usery. We booked this site back in November, which is pretty far in advance for us, and at the time there were only two sites available for a stay from Sunday to Sunday. Luckily, one of those was site #28, which is a huge, private site with no neighbors to the east, and a very long distance between us and our neighbor to the west. While this site is perfect for us, it’s easy to see how it might not work for everyone. There is a downward slant at the front of the site, and a tall concrete bar at the back. Which means a longer RV, with lower ground clearance, would most likely have a problem getting level. Lucky for us, we are just the right size and were able to easily maneuver into a perfectly level spot, both front to back and side to side. No blocks needed. Love it when that happens. The setting at McDowell is much more open than at Usery. 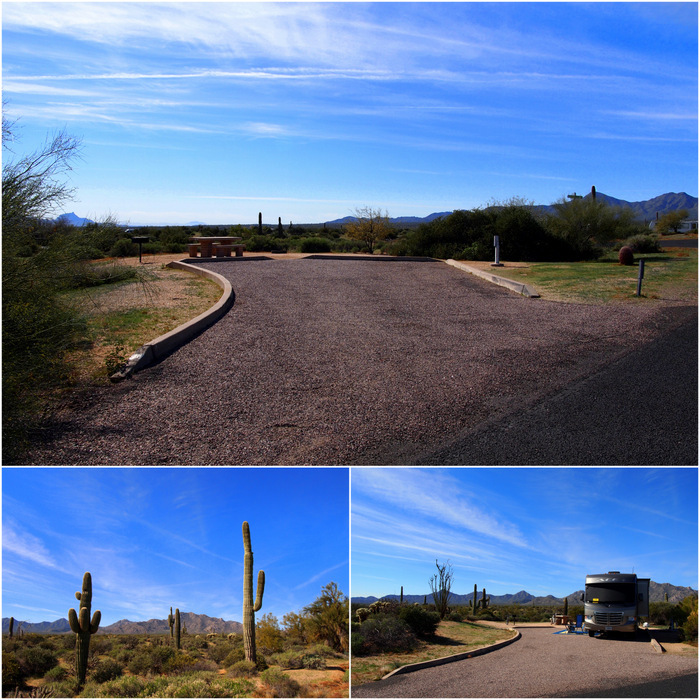 Pretty much every site in the park has a wide open view of the desert landscape and mountains looming in the distance. Since our site faces east we have a splendid view of the sunrise. 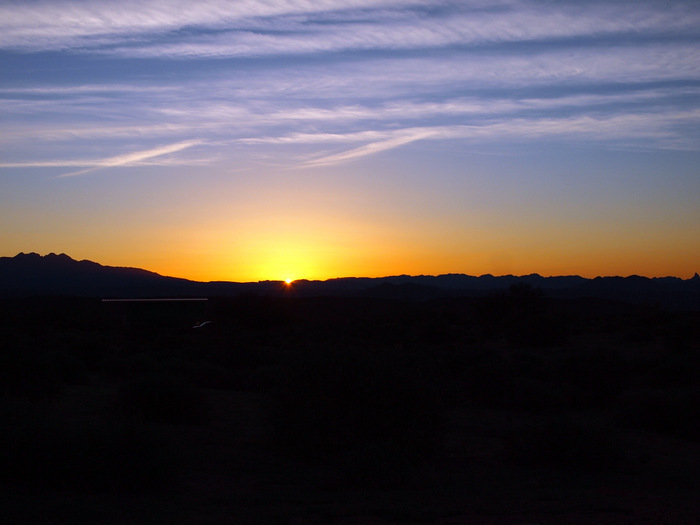 One morning I sat outside and watched as the sun rose over the mountains. My favorite part of sunrise is always when that first tiny glimpse of the sun makes an appearance. We also have a not too shabby sunset view. 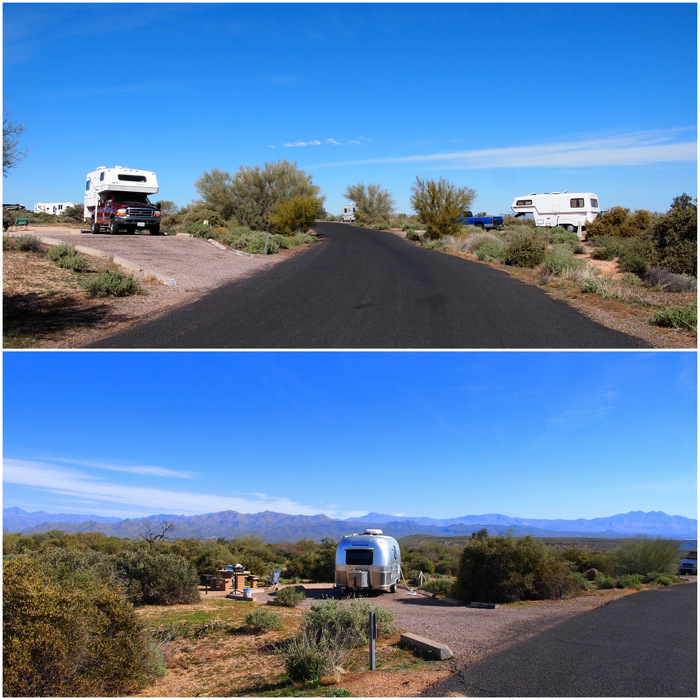 Our site resides in the older loop of the park (sites 3-40) where the sites are more suitable to small and medium size RVs. The entire loop is built into a hill and many of the sites are similar to ours with a downwards slant. I loved site #10 where the cute little Bambi in the photo below was camped, but the angle of the site was such that it would have been very difficult for even a trailer our size to get level. 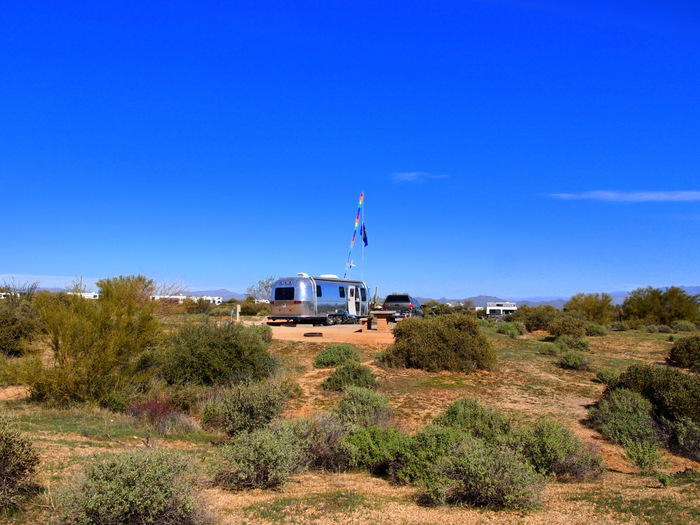 The new campground loop (43-70) is much more level, and the sites are even farther apart. 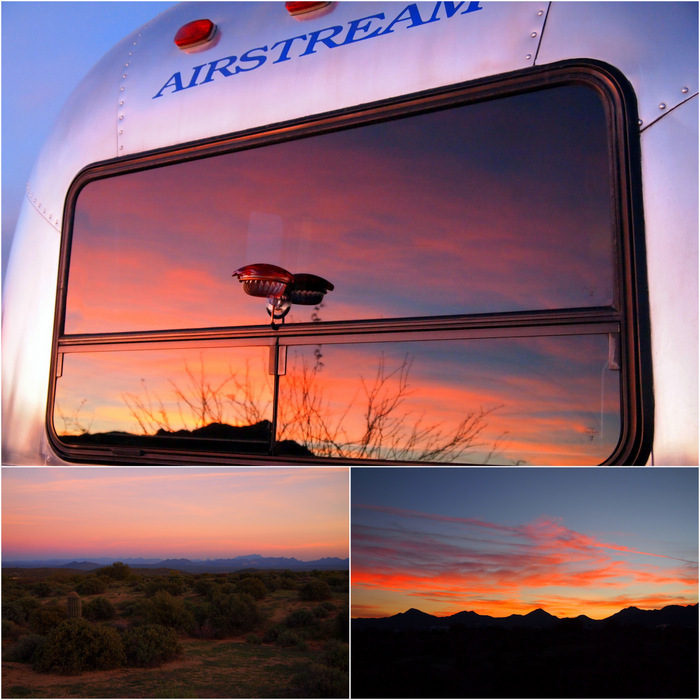 A few of those sites face west and must have the most amazing sunset views. I suspect these sites are the hardest to reserve. We’ve continued our routine of taking an afternoon bike ride here at McDowell. The trials are a bit different than what we found over at Usery- more wide open, less cactus, amazing views, and lots more hills. In fact, most of the trails are either gradually going up, or gradually going down. With so many miles of trails to choose from, there is an endless variety of combinations and loops to ride. So far we haven’t repeated the same loop twice and still have miles of trails yet to explore. The riding here is just how I like it. Physically challenging because of the changes in elevation, but not technically difficult. Which means I can spend more time riding than walking my bike. The most difficult trial we’ve tackled so far was called the Scenic trail. It had a very long, very rocky, uphill section that had both of us walking at one point. Luckily there was a nice bench at the top where we rested and took in the view. 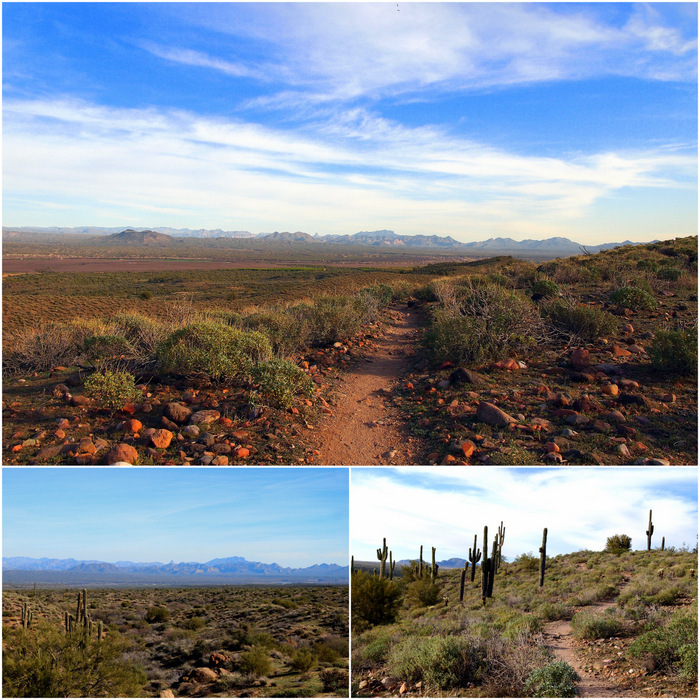 Mount Lemmon & more hikes at Catalina S.P. You’re in the site we had when we were there! It was a mighty squeeze for us (we even had to move that concrete barrier), but the views are excellent. So glad you’re enjoying the area!! Yeah that must have been a serious squeeze for you guys to fit in this site. You’re right that the views are awesome though! The park looks fantastic – I think we might need to seriously consider a visit when we return to AZ for the year-end holidays. You guys would absolutely love it here! The only downfall is how far it is from town. About 40 a minute drive to get anywhere worth shopping, eating or for laundry. Wonderful place. We were just there in late January for 2 weeks and biked every day! Actually 65 miles of trails although some are a bit more difficult than others. Many interesting places to visit even if a little drive but, hey, what a wonderful place at which to return!. I agree we love it here, and will definitely return again someday! Nice… reserved in November… not exactly adventure! How much did it cost you daily? Their site will not indicate prices. The cost per night here is $25 which includes electric and water, but no sewer. They say the cost may go up to $30/night in 2015. Wow, those views do look amazing! That sunset is gorgeous! Can’t wait to hit the road after we pay off some debt! Thanks for sharing this. Ill have to add it to my list of places to visit! Kudos on riding Scenic! We’ve hiked it, but when we got to the narrow rocky section, took it off of the biking list. Have you been down to the competition tracks, they’re close to the park entrance. The short one is very doable and is fun. I haven’t done the long one as I have heard technical things about it. It sounds like the word is out on McDowell, we’ve never had to reserve that far in advance. Good to know. Very nice post and pictures.